This proven system will help you profit in any market environment while trading any financial instrument. Whether you're a seasoned professional trader or newcomer to the world of investing, you must develop a defined methodology and consistently apply it to control risk, preserve capital, and harvest profits. 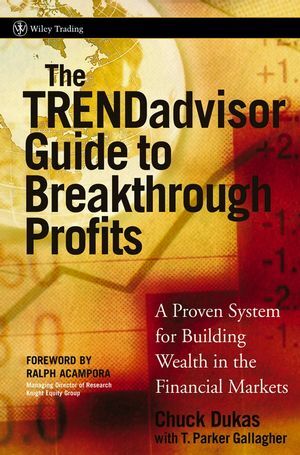 Now, The TRENDadvisor Guide to Breakthrough Profits outlines an integrated approach to market analysis and a sound trading strategy, known as the TRENDadvisor Diamond Methodology, this book will assist traders and investors locate low-risk/high-reward trading opportunities. CHUCK DUKAS is a Principal in a hedge fund and President of TRENDadvisor.com, a Web site that provides trading recommendations and education services to better equip traders to understand the markets and prepare them to trade independently. He is also President of the New England chapter of the Market Technicians Association. Dukas has written articles for Technical Analysis of Stocks & Commodities and Stocks, Futures and Options Magazine and frequently appears on media shows on the East Coast. T. PARKER GALLAGHER is a trader and investor. He manages a hedge fund, develops trading systems, trains traders, and advises portfolio managers on technical analysis and trading. He has an economics degree from Harvard University, an MBA from Babson College, and is an affiliate member of the Market Technicians Association. He has guest lectured at Babson College's Olin Graduate School of Business, MIT's Laboratory for Financial Engineering, and has conducted numerous workshops and training seminars around the country. Chapter 1: The Ins and Outs of Trends with a Toolkit for Analysis. Chapter 2: The Six Phases of the advisor Diamond. Chapter 3: The Recovery Phase. Chapter 5: The Bullish Phase. Chapter 6: The Warning Phase. Chapter 7: The Distribution Phase. Chapter 8: The Bearish Phase. Chapter 9: Pulling It Together. Chapter 10: Discipline and Money Management Come from Your Trading Plan. Chapter 11: A Lens on the Past.